THANK YOU WE CARE WE SHARE FOUNDATION! The Delta Academy Students and Staff would like to thank the We Care We Share Foundation for sponsoring the Josh Steven’s Foundation “Be Kind…Like Josh” program. Thanks to We Care We Share, all day school students and staff received a free BE KIND t-shirt. 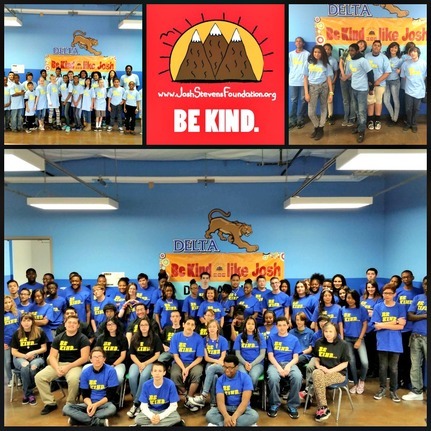 Every Friday is BE KIND day at Delta and all students are encouraged to wear their shirts. We are thrilled to have the opportunity to teach our students about the gift of kindness and generosity. The Delta Staff has been given ‘You Got Caught’ bracelets that are handed out when students are caught “being kind”. “‘You Got Caught’ will be a feature in our future newsletters where we will be highlighting our students acts of kindness. AND IF THAT WASN’T ENOUGH!!! WE CARE WE SHARE donated OVER 60 Thanksgiving Baskets to our families this holiday season!! The beautiful Thanksgiving baskets included a 15-20 lb. turkey, stuffing, mashed potatoes, gravy, veggies, cranberry sauce and all the fixings!! Thank you for making this holiday season possible for so many of our families!! !